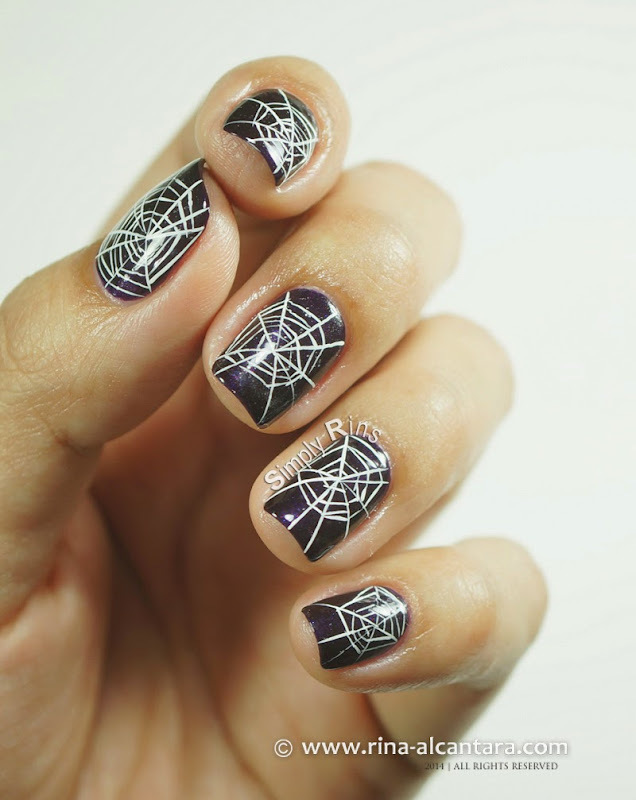 This is the first instance I'd be sharing a freehand cobweb nail art for Halloween. 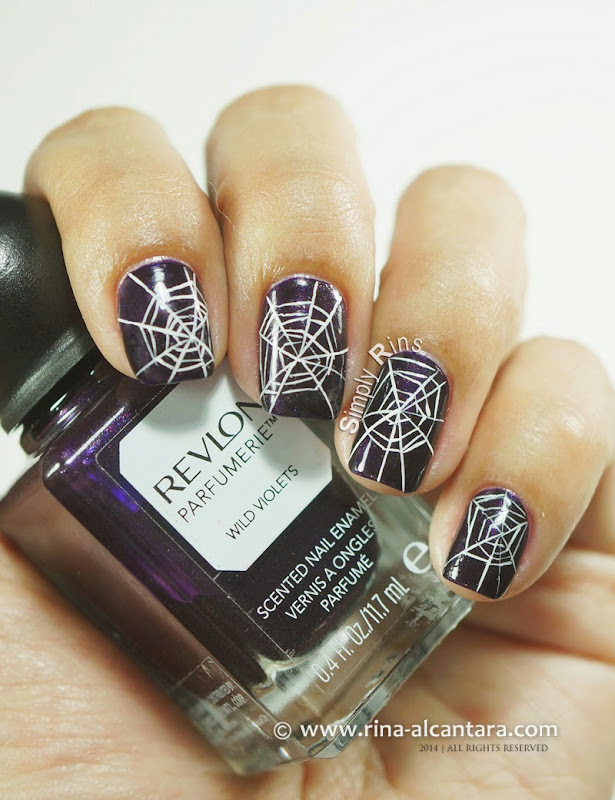 I wanted a more realistic feel of spider webs every time I include them on my designs, but failed miserably without using stamping plates. I gave it another try for this year's 2014 Halloween series and I really love how it turned out. I was aiming for a not so uniform looking cobweb. To me, the results were quite satisfying and I knew I got the look I wanted because someone actually asked me where I bought this nail sticker while I was at the mall the other day. It was flattering. I used 2 coats of Revlon Perfumerie Wild Violets as base polish. Let me dwell on this for awhile. It is one of the scented polishes from Revlon. The company has released scented nail lacquers before. The main difference is in the bottle. The new collection comes in an edgy bottle with a circular cap. I was able to purchase a few colors of Revlon Perfumerie collection and I haven't gotten around to swatching them. The polish name is the scent you can expect. The scent is only evident the moment it dries on your nails. The smell is not powerful and can be detected when near the nose. It also does not lose its scent even with a top coat. Although I am used to the smell of nail polish, the Revlon Perfumerie offers a great alternative. The downside is that the smell does not last longer than 2 days. I'd also like to point out that I am not fond of the circular cap. It is tricky to hold during a manicure. For the design, I used a trimmed striper nail art brush that only has 3 bristles. I used the longest that I have. And I must say that after this nail art, I'm having more ideas. I'd like to explore the possibilities of fine lines. I initially wanted to use a black polish for base. But when I was reaching for one in my rack, I noticed 6 unused Revlon Perfumerie bottles (all vampy shades, by the way) and decided to use the deep purple instead. I figured it would make the webs pop out anyway because it is dark. I also thought of using a dark red. I think that color would work too. It was particularly difficult to photograph this nail art because I wanted to minimize the glare from the lamps I was using so as not to cover the design. I actually have access to sunlight but am too lazy to transfer my photo setup outside. Anyway, I noticed that this is one of those nail art designs that looks better from afar rather than up close. So I tried to take a picture of it from a not so far distance. Is freehand nail art wonderful or what! I hope you liked this. I know it is a simple design and you can easily just use a stamping template to create a similar manicure. But sometimes, even if it is more challenging to do it freestyle, the fulfillment it gives you at the end is worth it. Glad you liked this! It's my first time to try having such few bristles on my nail art brush. It was worth it after creating this nail design.